Radar was born blind so immediately we assumed his nose skills would be excellent – not so. Yes, he could smell something or someone in the room or area but he could not find the object with his nose. I referred to Radar’s nose as being global but not targeted. He needed nosework; he needed to learn how to follow his nose. I can work him in familiar surroundings so he doesn’t get overstimulated or distracted, this nosework alone is hard work for any dog, much less a blind puppy. I can work at Radar’s pace. If Radar needed to redo lesson 2 for 2 weeks, we can and we do not get left behind or have to rush through anything. Radar can work at his pace. I can watch and rewatch and rewatch the lessons to make sure I get all of the little nuisances and trust me nosework has some definite nuisances. The downside is that no one is there to correct your technique or offer advice but I videotaped all of my sessions and could then watch and critique myself. I also found an Open Nosework forum on Facebook and posted the videos there when I had questions and received some great input and suggestions. Radar and I completed our Nosework 101 six week course in about 12 weeks. We had to repeat several lessons, stayed on some lessons longer and did a lot of reinforcing of our initial lessons. This has all been valuable as Radar is now developing a targeted nose. Before the nosework class, Radar would smell food or a toy and then run in circles until he stepped on the food or the toy. Now I can watch Radar put his nose to the ground and follow the scent to the food or toy. 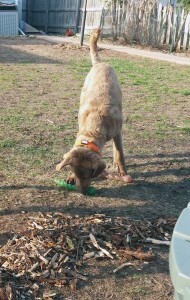 I watch this daily in my backyard as he searches for a Kong Stix. He still runs a pattern but his nose is on the ground and he gets much closer to the toy and actually finds it with his nose before he steps on it. I can see this nosework will be a lifelong skill that Radar will need and we will need to continue to refine and practice. Being blind makes his sense of smell very keen but learning to follow his nose did not and does not come naturally to him. It is a skill we will continue to develop and practice. Here are a few videos of Radar doing his nosework lessons. In our first nosework session, I have birch scent in one hand and treats in the other. The object is to get Radar to touch my birch scent hand and he will get a click and a treat. As you can see, Radar smells the treats and is frantically searching for them. He is looking on the floor and all around. Finally after about 2.5 minutes, he is starting to find the birch scent in my right hand. After 14 working sessions, Radar is finding the birch scent in the correct box on the ground. This is where he is learning to follow the scent to its location. This is has been the real value of nosework for Radar as before this he did not know how to pinpoint the location of a particular smell. Radar after 3 months of nosework sessions. One thing I have learned from this process that nosework sessions are hard work for the dogs and so I keep them short and fun. My sessions are less than 5 minutes. Since I no longer do them every day, I warm Radar up with the scent in my hand so he knows what we are doing and what he is supposed to find since he uses his nose to find stuff of his own choosing all day long. We have not yet taken the next level of nosework class but will be doing that soon.